Variety of Surugafukurin. Called as Shishinden when Suruga-fukurin’s variegation change to yellow from white. 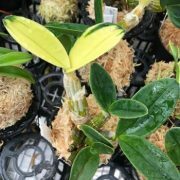 New leaves come up with cream yellow and grow to blight yellow variegation. Blight light is recommended to produce dark yellow variegation. (if the place is too shady, easy to mutate back to Suruga-fukurin). Very popular because of those gorgeous appearance.